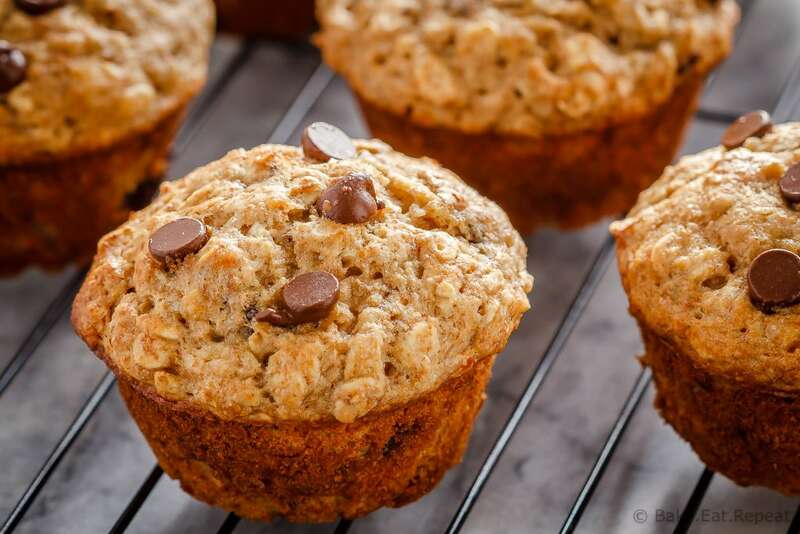 These chocolate chip banana oatmeal muffins are super easy to make. 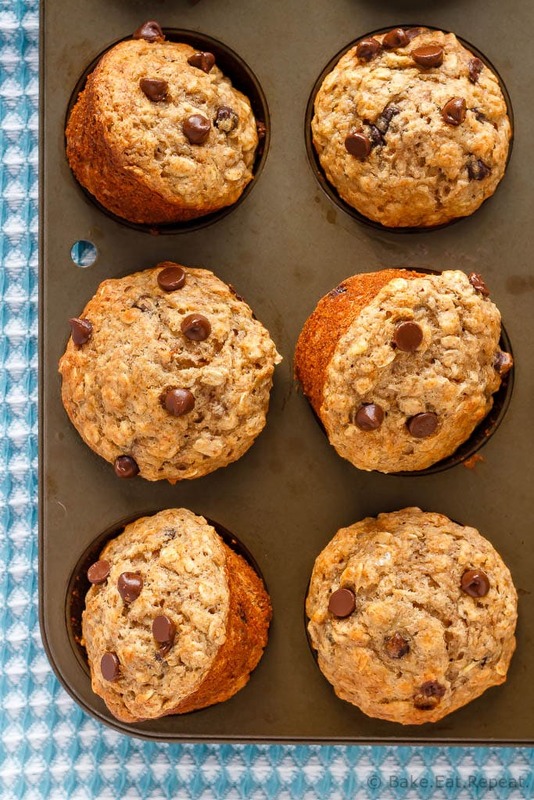 Filled with oats, whole wheat flour, and bananas – they’re healthy enough for breakfast! We love muffins around here. I make them on at least a weekly basis, usually more often then that. And if I’m not making them, one of my kids are – they’re so fast and easy to whip up that it’s the perfect thing to suggest when the kids decide they want to bake something. Also, muffins are usually at least moderately healthy, so I like having them around for quick and easy breakfasts, after school snacks, or to toss into the kid’s lunch boxes. 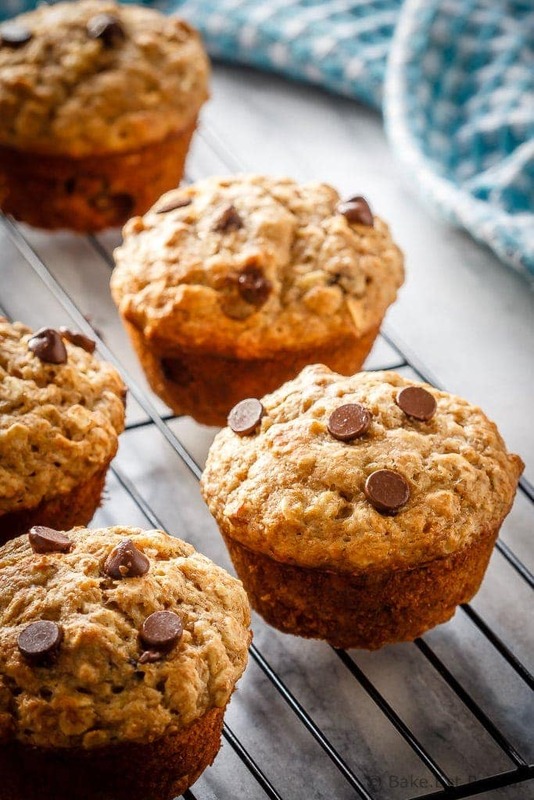 These chocolate chip banana oatmeal muffins are one of our favourites. I’ve been making this recipe for years, and it’s usually the first thought in my head when I have over-ripe bananas to use up. These muffins are filled with oats, whole wheat flour, and bananas, and make an easy breakfast that is filling and healthy. Yes, there are chocolate chips in them, but you could easily leave those out if you want them to be healthier – I just have this complete inability to make banana muffins without chocolate chips in them. Sorry, it can’t be helped. Banana muffins should have chocolate chips – that’s just a fact. Although I will admit that I would still happily eat one of these banana oatmeal muffins without the chocolate chips too. It’s always a debate what to make with ripe bananas when we have some, but these oatmeal muffins definitely win a large percentage of those debates. 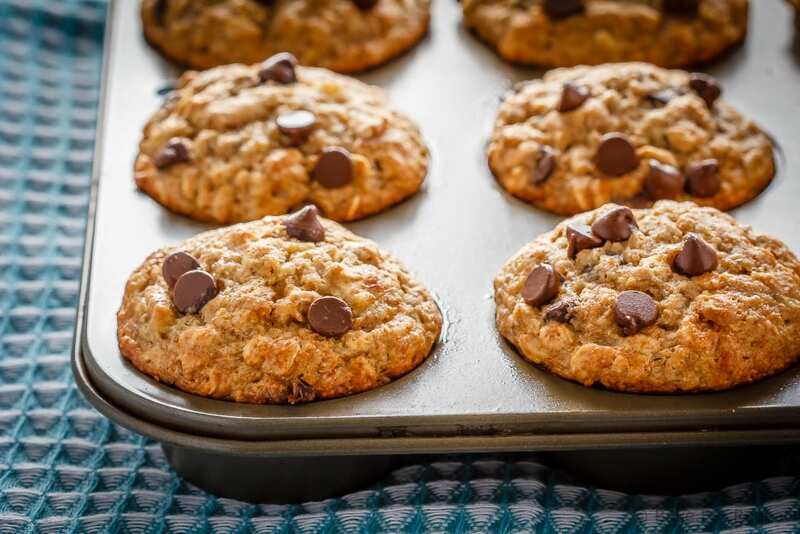 These peanut butter banana blender muffins and these chewy chocolate chip banana cookies are also amazing though, if you are looking for something different. But you should probably try these chocolate chip banana oatmeal muffins first – they do usually win out, after all. I’ve also shared this Chocolate Chip Banana Oatmeal Muffins recipe over on Food Fanatic. Can I store it in an airtight container room temp? Or it should be in the fridge? Yes room temp is fine for these muffins. I always leave them in a container at room temp. They should be good for 5-6 days at room temp. these are fab! Are there any substitutes for the sugar? Hi, I haven't tried this recipe with anything but brown sugar. I think they would still work well if you decreased the amount to 1/4 cup - although they obviously wouldn't be quite as sweet (and they aren't overly sweet to begin with). As far as substitutions though, you could try honey or maple syrup but they won't turn out exactly the same with the higher amount of liquid. They also taste sweeter in baking I find so I wouldn't use a full 1/2 cup of either of those. You could also try brown sugar Splenda - it usually substitutes 1:1 I believe and should work well, but I can't say for sure as I don't ever use sugar substitutes in my baking since I don't like giving those to my kids. Good luck - let me know if you try any of those! These were amazing!! We also added a teaspoon of vanilla because I love the smell. Thank you! Could I use regular white flour if I don't have wheat? Yes you can substitute regular all purpose flour. These were AMAZING!!! My children devoured them. This is a lovely, healthier breakfast muffin. I even added applesauce because I didn't have enough bananas...so moist. This will be a regular in my home from now on. Thanks for sharing. 204 calories per muffin - if you click on the Food Fanatic link, the nutrition info is at the bottom of the recipe card on the post over there. It just doesn't show up on the recipe card on my site, but anything that is also on their site has the info over there. Made them. Happy to have a whole wheat flour recipe that doesn’t taste dense. Excited for kids to have somewhat healthy snack this week. Not I! I’m following WW and these muffins are 6 points. I’ll stick to my protein muffins this week. These muffins are delicious! I'm will continue to make them.